This exciting tour takes us deep into the wild forests in and around Karula National park and over here silent lakes. Experience space and quietness from your own sled, together with the enthusiastic dogs from your team, in a white world. Via the southern half of the Karula national park we reach the hilly area in the southwest and enjoy a stunning view over millions of treetops. We cross lakes, pass through swamp areas and come by several empty wooden houses in the vast pinewoods. The first overnight stay during the tour is in a wood heated wilderness cabin at the lake Ähijärv, or the diehards can overnight in an open shelter in an arctic sleeping bag. The second night will be in a heated forest cabin at the lake Ähijärv, which forms the part of the Karula national park. Together we prepare our dinner outside on a campfire, or inside above the open fireplace. The tour is carefully build up, beginning with 20 km over forest paths, than 40 km through slanting forest- and swamp areas and ending with 45 km through hilly landscape. Including the test drive on the first day the whole round trip covers around 110 km. We invite you to join adventurous dog sled tour in and around the national park Karula, in the south-east of Estonia. On your own sled with dog team you follow the guide into the wild forest, where you visit the most beautiful places in the park during tours from several hours up to moreday trips with bivouacs. The tour is provided by one of the few working Alaskan Malamute kennels in Europe. 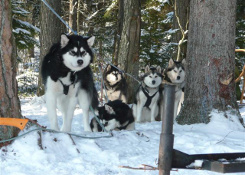 The kennel likes the old style way of life and use for the sled tours authentic polar dogs. Kennel dogs have a thick fur and are capable of running and sleeping outside all winter long in arctic temperatures without jackets or booties. 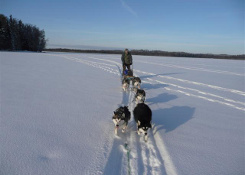 Our offered dog sledding tour is a private expedition, for maximum 3 persons. The kennel is deliberately small-scaled, so that each dog has enough personal attention and care, and so that the kennel can give you as a traveler intensive guidance in a familiar atmosphere. On the kennel base camp you stay in a private log house with wood stove, bordering the dog yards. You are a personal guest and live with the kennel owners and the dogs during the whole stay. All together you enjoy homemade dinners with Estonian influences and enthusiastic polar dogs. Naturally you become one with the silence of the nature. Every tour is a round trip that starts at Karula kennel base camp and also ends there. 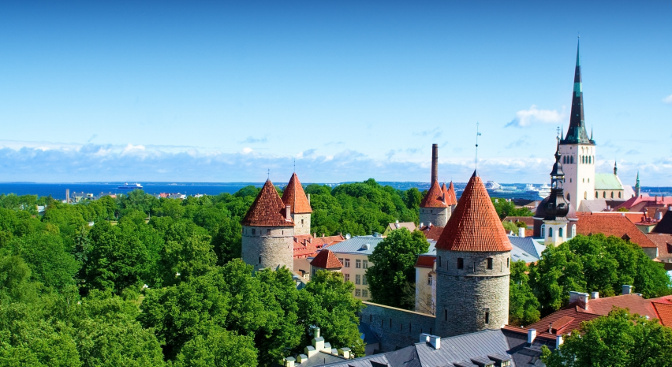 Transfers from and to Riga airport are organized separately. 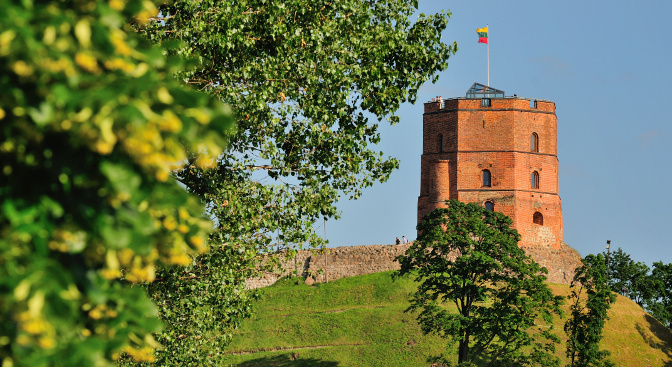 You are being picked up at the airport of Riga or at the hotel in Riga (if arrive some days before). At the end of the afternoon you arrive at Dog sledding expedition base camp, after which together we enjoy a nice dinner near the wood stove in our authentic living kitchen. You spend the night in your own rustic log house. Day 2: The expedition may start! After a good breakfast we give the dogs their morning bouillon. Also cleaning up the droppings is part of the daily care. Next you get an extensive explanation about how to drive the sled, harness the dogs and the progress of the tour. We fit the complete winter outfits and then its time for the first mushing experience. After you have harnessed up your own dog team you individually leave with the guide for a test drive of 7 km. On the way you learn how to block your sled and several handle mushing tricks. After lunch we prepare ourselves for the expedition and travel to the first bivouac place at a desolate lake. There we shop wood, make a campfire, feed the dogs, prepare our dinner and make up the beds. We work together as a team and everybody pitches in. The cold has made us tired, but in a wood heated wilderness cabin at the lake, or for the diehards in an open shelter and a warm arctic sleeping bag you can dream of sunny, tropical beaches. After a simple breakfast near the morning campfire and caring for the dogs we leave for a tour of over 40 km. 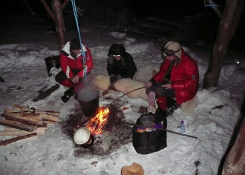 We will be on the sled for 4 to 5 hours, after which we arrive at the bivouac place again. First we install the dogs, then we go ice fishing and we spend the evening next to a crackling open fireplace, enjoying a delicious salmon meal and our own company. A good breakfast gives us the energy needed for the longest and heaviest tour through hilly landscape. We pass through a viewpoint where we let the vastness of the forest around us affect us. Today there is a big chance we cross wild animals. Bears are asleep now, but wolves, foxes, moose and deers can stir up the hunting instinct of the dogs, resulting in a exciting acceleration. In the late afternoon we return to the base camp, where a hot sauna awaits us and a blessing of delicacies and domesticity. After the overnight stay in your log house, a nice shower and breakfast we say goodbye to the dogs and head back to the Riga airport or Riga hotel. Basic winter clothes, see packing list below! Daily temperatures can vary between + 3 and -25 °C. To sled comfortably at -15 °C we offer you the necessary clothes, as described above. In addition, you have to bring yourself: skiing trouser and jacket, thick cap, skiing glasses, long thermal underwear (upper and below), 2-3 fleeces wearers, 1 fleece trouser, skiing gloves. Best is to use the layer system, so that you can remove layers when its warm. All clothes are best from synthetic material or wool. We advise strongly against cotton, because this absorbs sweat, which makes you cool off fast. 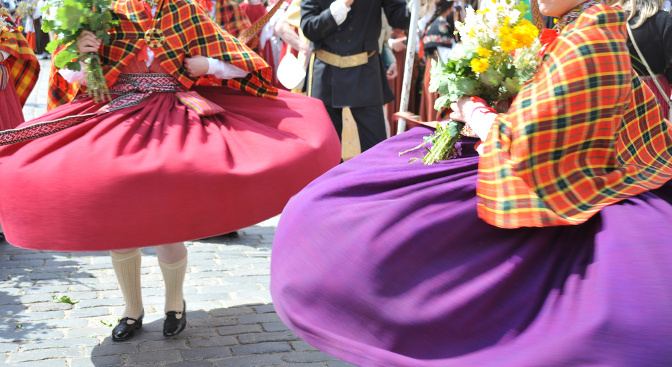 The tour suits for people with a VERY good physical condition, a good sense of balance and good concentration. Possible extreme cold, fallen trees and other obstacles on the trails, pushing up steep hills and the responsibility of your own dog team make the tour physically and mentally challenging. Depending on the individual- and group level the guide may decide after the test drive that one or several persons will take part in an alternative program, without refund of part of the travel fare. Sled dog expedition Company is not responsible for loss of, or damage to properties or of injuries incurred during the program. Because weather conditions can be extreme the use of alcoholic beverages during the tours are prohibited. Please contact us info@grandbaltics.com to make a reservation for Dog sledding expedition in South-Estonian wilderness.